I am now very happy that I have access to clean and safe water. This will help me get more production from my farming activities and also I will no longer get sick from water born diseases nor will my family. 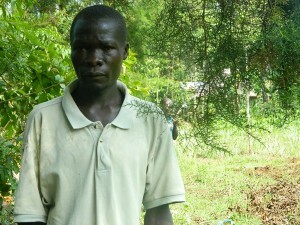 Christopher, a 32 years old man, hails from Shianda Community where he is an active farmer. He is married and is a father of two children who have passed away recently due to contaminated water. “I am very sad to say that I buried my two children recently because they suffered from cholera and typhoid which was a result of taking in dirty water. My family and I had no option, other than taking in such water because it was the only source in our village.” said Christopher. Finally, Christopher had a reason to smile when he realized that the Bridge Water Project was there to help him find a solution to his problems. The Bridge Water Project rehabilitated a well, which had been constructed but eventually vandalized and destroyed by unknown people a long time ago. When you invest in The Water Project, you're investing in people like Christopher. Your gifts help us reach more communities with the gift of clean, safe water. And every drop helps unlock potential.